I made a good behavior system for Ella yesterday and it has already worked so well! I wanna be so bold and say it has been life changing but I don't want to jinx myself. I really am so happy with how well Ella has responded to it. Ella helps me out so much with McKenna and I am so proud of how well she has adjusted to becoming a big sister, a new house, new school, big girl bed, big girl potty, the list could go on and on. We have turned her world upside down and she hasn't missed a beat. There are so many times during the day where I just praise Ella on how much of a help she is and I have always thought it would be great if I had some kind of reward system for her. So I began googling chore/reward charts and didn't really find anything I loved. So I laid in bed night after night thinking about what I could do for my sweet little Ella Reese. 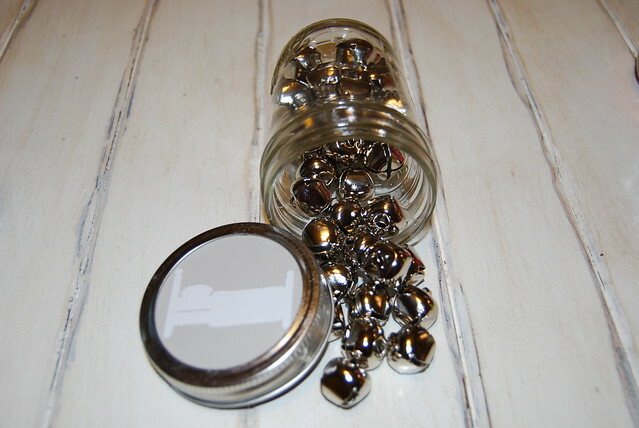 Ella is a hands on learner so I thought some type of jar system would be fun for her. 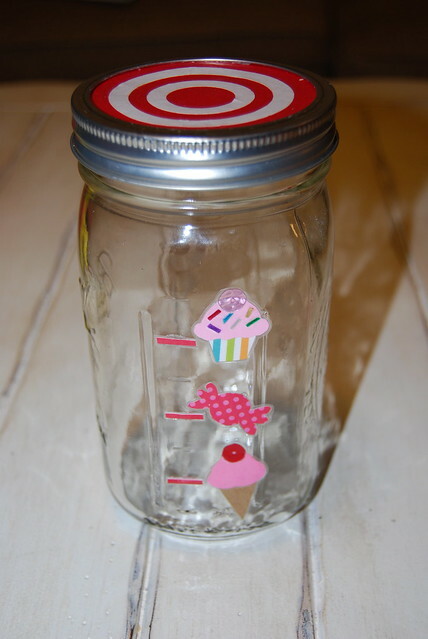 I used 6 small mason jars with each one as a designated chore/behavior. I then used a big mason jar for the reward. I cut circles out of colored card stock and then used my silhouette to cut out the images on white paper. I glued the cut out onto the card stock and then put a coat of mod podge over the top. I put a little dab of hot glue around the edges of the card stock and stuck them to the mason jar lids. I filled each jar with something different. Washing hands after she goes potty is how she gets a green jewel. Brushing her teeth is how she gets a button. Any kind of clean up around the house gets her a blue marble. Going to bed all by herself with no crying gets her a jingle bell in the morning. Good manners and eating healthy gets her a pink pom-pom ball. 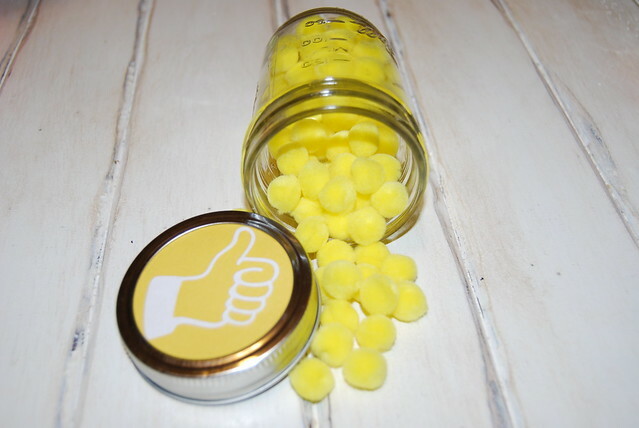 And any time I give Ella the thumbs up means she did a good job and gets a small yellow pom-pom ball. 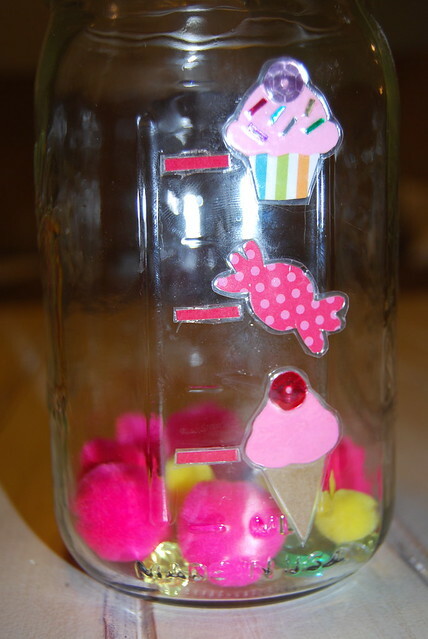 The big jar is where Ella puts all her rewards. Once the jar is full to the top she gets to take a trip to Target and pick out a toy. 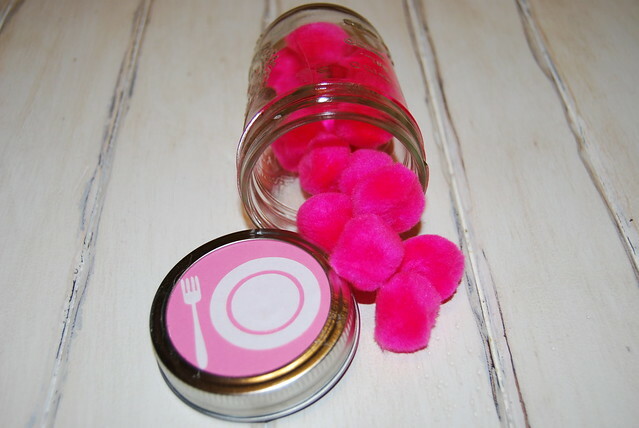 The jar will take a while to fill up so I wanted to have little treats in between so she didn't get discouraged. Once she fills the jar 1/4 of the way she gets an ice cream date with dad. Filling the jar 1/2 way is a trip to the candy store and 3/4 of the way is making cupcakes with me. 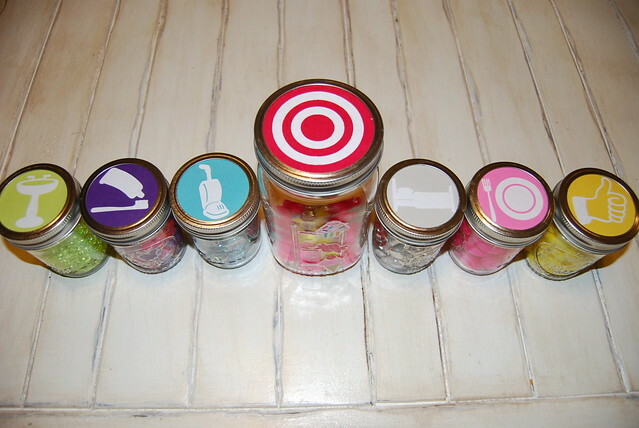 I made the ice cream, candy and cupcake labels by just drawing and cutting them out on card stock. I glued sequins on for cherries and I cut up little pieces for the sprinkles on the cupcake. I then laminated them to help keep everything together. 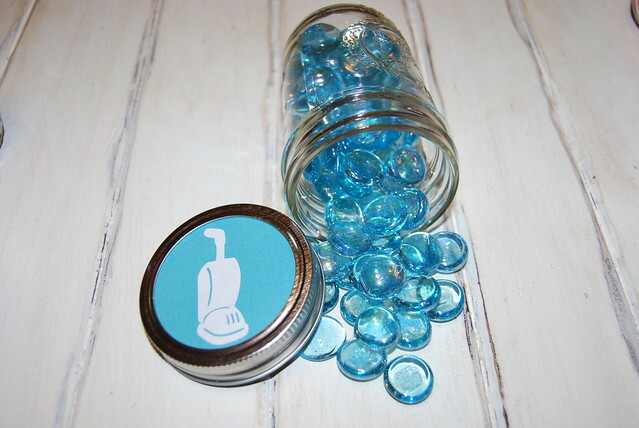 I hot glued them to the jar. Look how close she already is to an ice cream date with dad! It really is unbelievable how much Ella has loved this. One of the things I have been trying to work on with Ella forever is responding to people when they speak to her. Even when it is someone she knows and they ask her something simple like her name, she says nothing. Not a word. I have explained the whole stranger danger thing and she knows the difference between someone that mommy knows and someone that is a stranger. Anyways, today while we were at the vet the nurse asked Ella how old she was. Once again Ella didn't even pretend to respond. When the nurse left I explained to Ella how it was polite to talk back to people when they spoke to her and that if she would use her good manners she could have gotten a pink ball from her jar when we got home. Ella's response to me was "I don't want a pink ball." Great. The plan back fired is what I'm thinking. Then as I am checking out at the vet a sweet older woman says to Ella "are those pink polka dots on your dress?" Ella looks up at me with the biggest grin and then turns to the woman and says "YES!" I couldn't believe it! This was a big step for her! I was thrilled! The second we got in the car Ella told me how she gets to put a pink ball in her jar when she gets home. It works! It really really works! Tonight for the first time Ella went to bed all by herself. Usually Bob or I have to lay down with her for the first 5-10 minutes till she falls asleep. But tonight she climbed in bed and said she wanted a jingle bell! Are you kidding me?! Is it really gonna be this easy?! 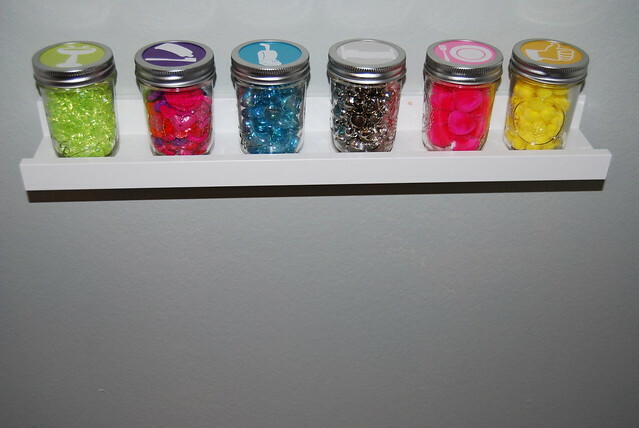 All the jars sit so nicely on an IKEA photo shelf. 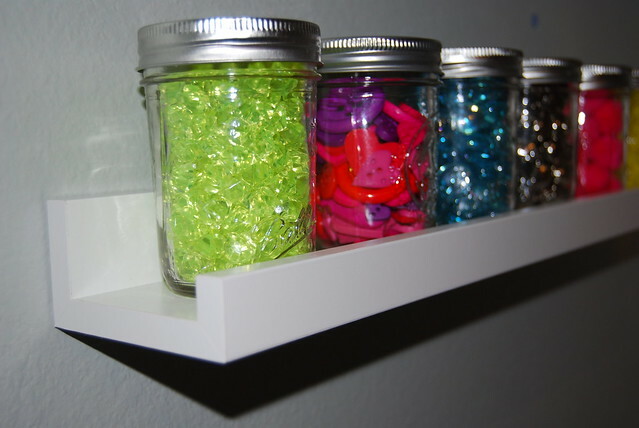 I think I might have one of these shelves in every room of my house now! I just love them! 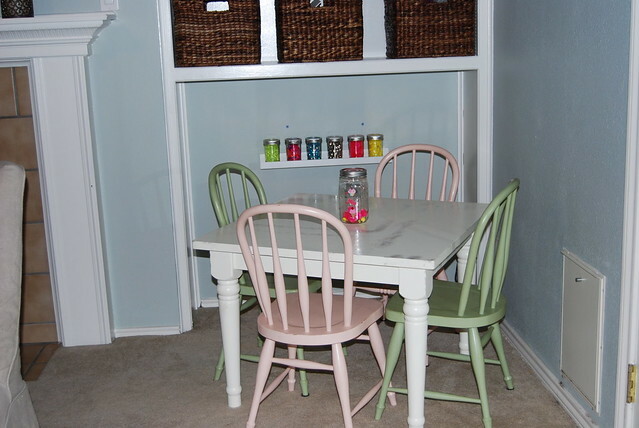 Bob hung the shelf behind Ella's table and chairs and then the big jar sits in the middle of her table. This really was so easy to make and so far I would say a full success! I will keep you guys updated on how it continues to go. 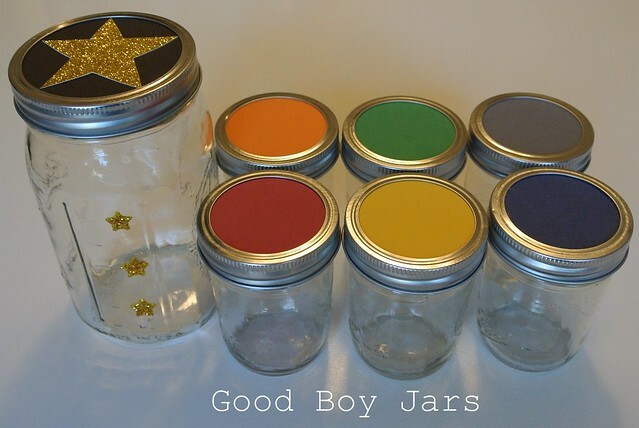 If you want to buy a set of good girl/boy jars go to our etsy shop! 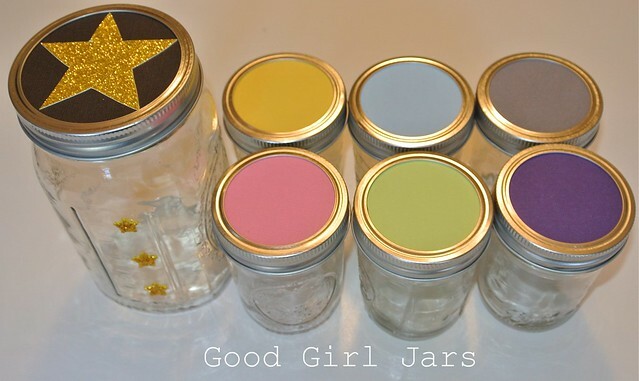 Here are the updated version of the good girl/boy jars that I sell. 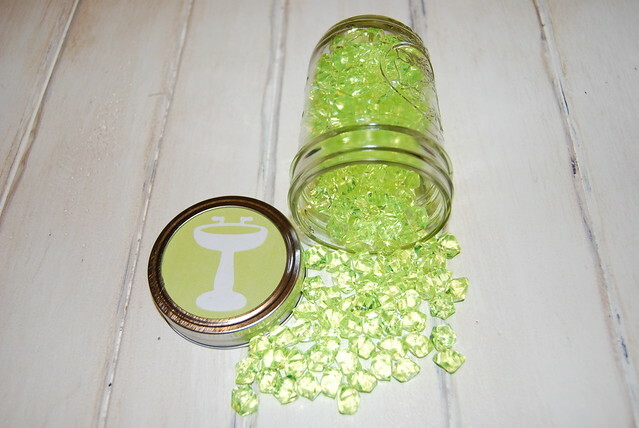 In our etsy store there are different labels that you choose from so I can customize your own jars. I LOVE this!! We do sticker charts with Caleb but I think we'll have to add in something like this. It's adorable AND functional! So, so great! Where did you get the images for the different chores? Did you make them? allison this is genius!! i love it and it's such a cute decoration! You always make me cry. You put so much love and thought into everything you do. That's why IT WORKS! Shut up! This is the cutest thing ever! You are the most fun mom ever! Sweet Ella is such an angel. I know y'all will love this!! Seriously how did you get to be so creative?!?! Share some with your sister please. That is so cute! I can't wait to see it when you get here! wow, great idea!! we have been wrestling with some behavioral issues lately (esp going to bed without filling their bed with toys). we might just have to try this! you are the cutest mom ever! You are so smart and creative!! So proud of your mommy skills! i pinned this on pinterest. :) hha!! looooove it. I love this idea! I am going to try it, but it won't be near as cute. Such a wonderful and precious idea! 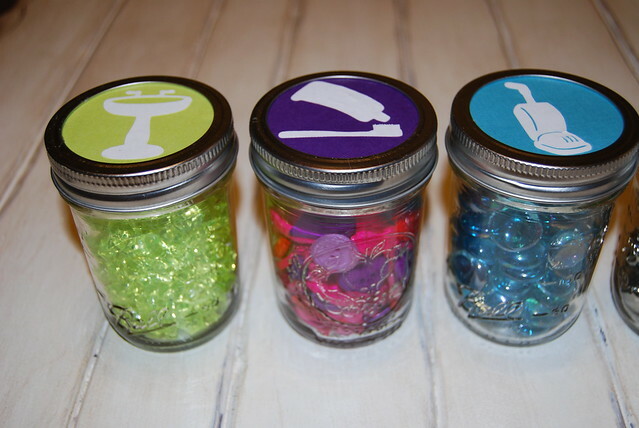 I loved reading how your daughter responded to the jars. My little girl is only ten months old so we have a ways to go before we impliment something like this, but it is something I really want to remember. Love it! I am going to try this!! Where did you find such cool images that all go together? Or did you create them yourself? Do tell, please!!!! Absolutely the most ingenious and creative idea I've ever seen!!! I love it, wish I would've had something like this when my daughters were small. Think it will work on teenagers?? this is fantastic. simple, super cute and easy to follow system. i like it a lot. thank you! 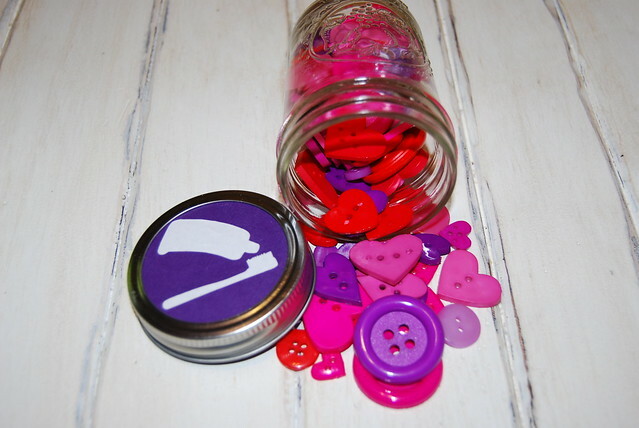 I've been searching for rewards jar ideas and yours is the first I LOVE. 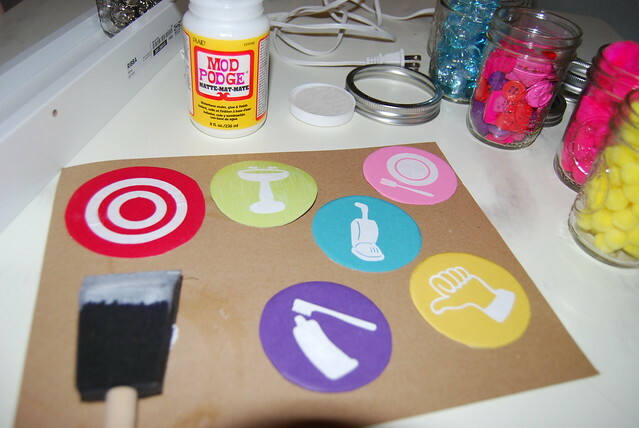 Going to Michaels tomorrow and getting it started ASAP! If it works - it has too, right ;) - I'll post here! Thanks for sharing!! What an amazing idea! Great for not only visual children, but touchy-feely (as I call them) kids too! Mine are both, and I cannot wait to go shopping tomorrow! I found you through a different pin on pinterest, and am totally happy I did! I pinned you, hope you dont mind, but I have to share this AWESOMENESS with the world!! Thanks! Funny story; I was actually searching the web for "gifts in jars" to throw together for my extended family Christmas party this weekend, and I found this most amazing post ever instead. I want to cry because I think it might have saved my life. I have an almost 3 yr old who has become very defiant as of lately. I attribute alot of it to moving and the addition of her (now) 10 month old brother, but regardless, there is no excuse. I have been trying desperately to find a gentle way to correct her behaviours and encourage her to do the simplest of things like get dressed (she's a proclamined nudist!! ), brush teeth, etc. etc. (you know all about it I'm sure!). Anyways, this systems seems like it will do WONDERS for her. She is very visual and loves having rewards in her hands. I can only imagine the excitement that will come as I watch her fill up her jar towards a much anticipated treat!! 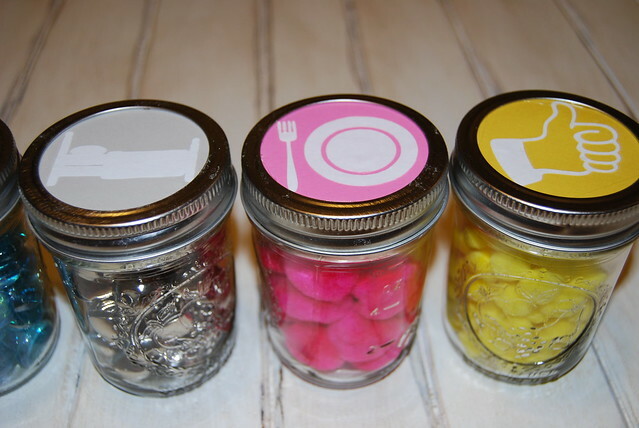 Now I have to add another box of jars to my shopping list and find the time to create this!